Literary short stories by established and emerging writers.Joseph Chavez Stowaways Marshall says it was like possibility itself. Life like an old clock, wound up after three years of silence and set ticking once again. "Yes!" Steven says. "Exactly." This is the opening he was looking for. Siamak Vossoughi The X-250 Mr. Rezai had melted, like a man falling in love, only in a movie that was too sentimental to be believed. George had never seen him look that way before. Melissa R. Sipin Walang Hiya, Brother I can never tell anyone this. You know how it is, with family. The things you can't say, the secrets they hide until the omissions crack the surface, start fractures, evolve into lies. Mehdi Tavana Okasi The Hate "I would never have let you become a soldier," my mother said to me in those years, recalling how we'd fled the eight-year war with Iraq. Sean Padraic McCarthy Speak to Me She felt him leave, she later says, the energy shooting up through her hand. But now everyone is just shouting goodbye, I love you, we'll miss you. All at once. A family usually quite quiet, reserved, now a chorus of grief. Gone. Eugene Cross Miss Me Forever While he waits at the bus stop, Tulsi leafs through the free Bible each student received after class. He can hardly believe how thin the pages are, like the wings of an insect. Elizabeth Kadetsky What We Saw Mice, bugs, heat wave, neighbors, mattresses: all since the little earthquake. "The little earthquake," people call it, like it was as benign as a stuffed animal, a creature innocent beside the morning grapefruit. Kim Brooks Hialeah "Peach Tree? Very aggressive sounding." "It says here she's a maniac, bred on nothing but cabbages and beets." "A Jewish racehorse. How could you go wrong?" Robert Powers Maghreb and the Sea We knew it was time to leave when we realized we'd have to become miners after running out of money. I told you I'd rather drown in the sea than be buried in a cave. Gil Filar Here for Life In December the heat blasted and the humidifier rumbled round-the-clock. Melody stayed inside more, overeating kale and quinoa and Hungry Man turkey dinners. E.A. Durden The Orange Parka Since the beginning of Prithi's sophomore year, when she began to attend a charter school in another part of Brooklyn, Rakesh has accompanied his daughter to the city bus stop where her route begins. Junot Díaz Interview by David Naimon That doesn't mean that I'm not sexist, that I'm not being sexist. The reader has to decide this. But I'm willing to risk the blowback. 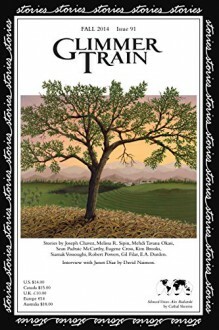 Publisher: Glimmer Train Press, Inc.